Petrol, diesel prices set fresh highs as fuel rates were increased further on Tuesday. 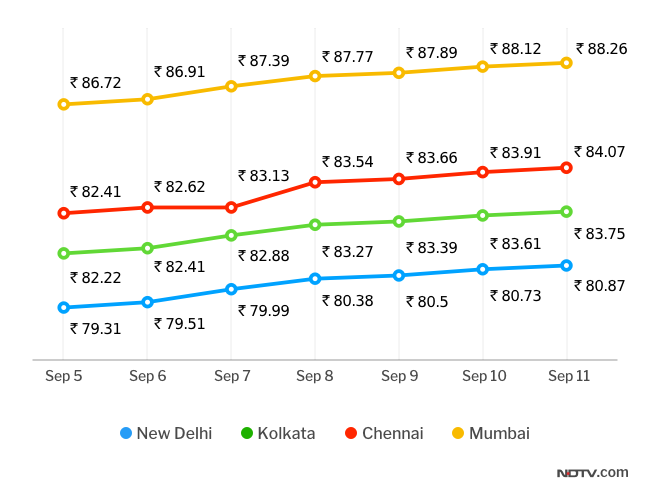 Petrol, diesel rates today: A litre of petrol was being sold in Mumbai for Rs 88.26. Fuel consumers in West Bengal got relief from the surging petrol and diesel prices as the government announced a Rs 1 per litre cut in fuel rates. Chief Minister Mamata Banerjee said, "We never increased the tax, we always think about common people. Since the price of petrol and diesel is going beyond limit, we have decided to reduce fuel price by Rs1 per litre." Ms Banerjee also demanded that the central cess should be withdrawn with immediate effect. "On one side when the price of crude oil is reducing, you are increasing the price, you are also increasing cess. You cannot increase two things," she said. Meanwhile, petrol and diesel prices set fresh highs as fuel rates were increased further on Tuesday. In Maharashtra's Parbhani, petrol prices breached the psychological barrier of Rs 90 and touched a scorching Rs 90.11 - a new record in India, an official was quoted as saying in a report by news agency Indo-Asian News Service. Meanwhile, in Delhi, a litre of petrol was being sold for Rs 80.87, Rs 83.75 in Kolkata, Rs 88.26 in Mumbai, and Rs 84.07 in Chennai on Tuesday, according to Indian Oil Corporation (IOC), the country's largest fuel retailer. 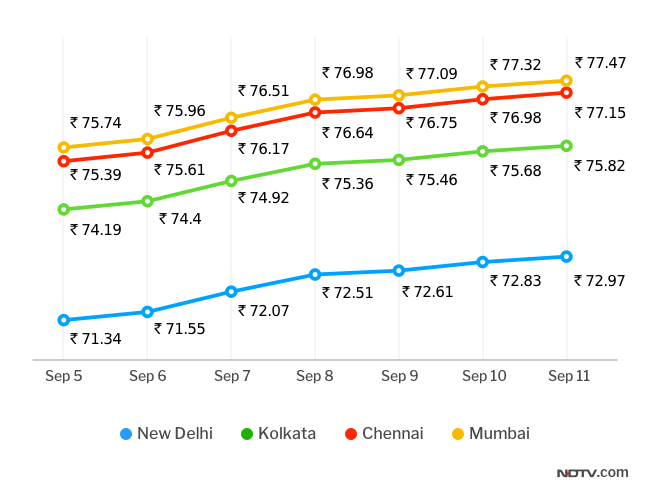 Diesel was being sold at the rate of Rs 72.97/litre in Delhi, Rs 75.82/litre in Kolkata, Rs 77.47/litre in Mumbai, and Rs 77.15/litre in Chennai. On Monday, the Andhra Pradesh government announced a reduction of tax on petrol and diesel by Rs 2 a litre. On Sunday, poll-bound Rajasthan slashed the tax on petrol and diesel. Chief Minister Vasundhara Raje announced a 4 per cent reduction which brought the prices of the two commodities down by Rs 2.5 per litre in the state. Petrol and diesel rates are revised on a daily basis by oil-marketing companies, after considering global crude oil rates and the movement of the rupee against the US dollar. The rupee has been plunging to hit fresh lows almost every day this month and has sunk 11.6 per cent so far against the dollar this year.